Visual Studio Code>Programming Languages>WebFOCUSNew to Visual Studio Code? Get it now. This extension for Visual Studio Code brings support for WebFOCUS files (.fex, .sty, .mas, .acx) with syntax highlighting and code snippets. Please note that the features here are available as of WebFOCUS version 8202M. 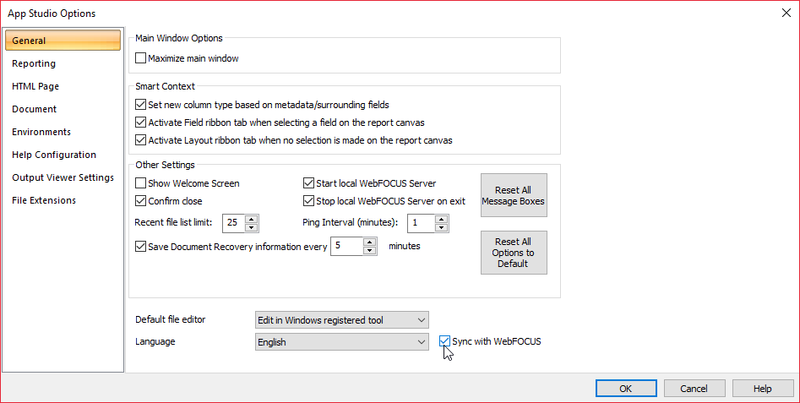 Some of the functions/features may not yet be available if you are using an older version of WebFOCUS. Change the file associations for WebFOCUS files (.fex, .sty, .mas, .acx) on your computer to open with VSCode by default. Make sure that 'Sync with WebFOCUS' (near the bottom) is checked. You can optionally change the default file editor to 'Edit in Windows Associated Tool.' This will allow you to simply double click on a file in AppStudio and it will open the file in VS Code. In VS Code goto File and select Auto Save to automatically save changes to WebFOCUS. Please use the Issues tab to report any issues or to make any feature requests. Releases Notes can be found in the changelog.